A little nook in the store, where you can test and use Wakako's stamps to customize your stationary, or Traveler's Notebook. Baum-Kuchen is a studio/shop run by a husband and wife team, they curate artifacts that are emotionally/physically durable, beautiful, and, inherently functional. We have been working with Baum-Kuchen for quite a while, collaborated on the inserts for the Midori Traveler's Notebook, Market Basket, and most recently on the Napkin Sketchbook. 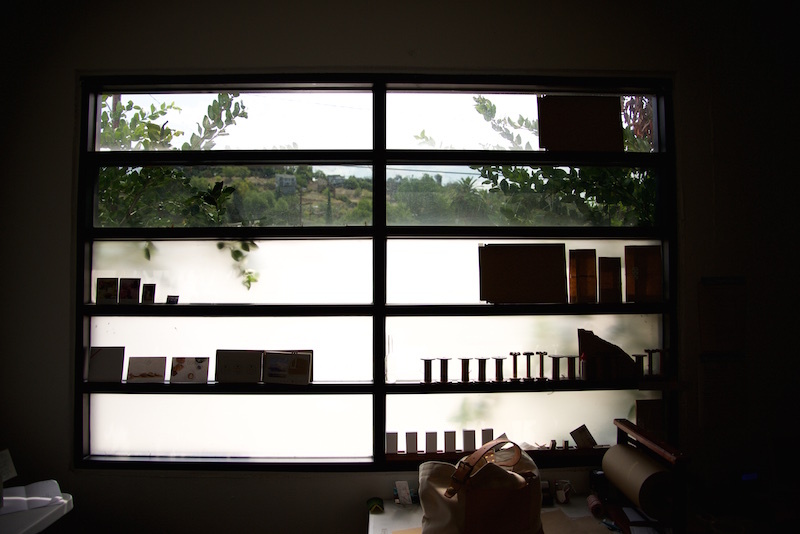 Baum-Kuchen store is located in Glassell Park, just 15 minutes east of our downtown LA workshop. We stop by the store at least once a month, for drop-offs, meetings, or just to chit-chat with Wakako, the store owner. Wall of artifacts sent in by customers or the friends of Baum-Kuchen. As you enter the store, you will see a wall space filled with postcards and letters on the left side. If you are visiting BK, be sure to spend extra time and enjoy the details of the letters and illustrations. The wall is truly a reflection of what Baum-Kuchen stands for,"love for analog". We especially enjoy looking at Eunice's beautifully crafted postcards. Store sample of our leather baskets in 2 sizes. It is slowly changing its color! Admiring the postcards and letters. Penmanship on some of the snail mail is amazing! We also like to discuss if there are any space to further improve the products. Started from pale brush color, slowly changing into rich caramel color. Each time we deliver an order for Baum-Kuchen we love going into the shop, discussing upcoming projects and how to evolve existing ones. The inserts for the Traveler's Notebook has been a great project as we learn what the customer is interested in, and even how to improve manufacturing techniques. The relationship has allowed both of our companies to grow together as we both work towards a common goal. Relationships like this is rare as we come from similar practices but we each bring different skill sets. Traveler's Notebook, new & old samples. Traveler's Notebook is the biggest inspiration for Baum-Kuchen. Wakako was motivated to open up a shop when she discovered Traveler's Notebook. So naturally, our collaboration began based on TN, and we have been designing and producing leather inserts for Traveler's Notebook products (as shown below). It has been an eye opening experience to say the least, and we are always very humbled by the words we receive from the enthusiastic community of TN users. We truly cherish the relationship we have with Art Journaling community, and very happy to be able to contribute through our products. Many other functional beautiful products. Found objects from Wakako's travels. Baum-Kuchen is also a great inspirational place for your future travel. Not only they carry Traveler's Notebook (name says it all, right? ), they also carry many great bags and stationary goods that will be a perfect travel companion. The space is often decorated with the objects Wakako found through her travels. Every little piece holds a story, which makes it special and unique in itself. If you are interested to read more about our on-going collaborations stories, please check our Projects page.